On this day two years ago – August 2nd, 2016 – we won 100% welfare- and pension-rate housing at 58 West Hastings. City council is now trying to go back on its commitment. Together, we have the power to pressure them to build the housing we need. This rally and march is organized by the Our Homes Can’t Wait Coalition, which the Carnegie Community Action Project is a part of. Please join us a3 pmpm on Thursday, August 2nd at Main and Hastings. This event will mark the next step in our campaign for 58 West Hastings. 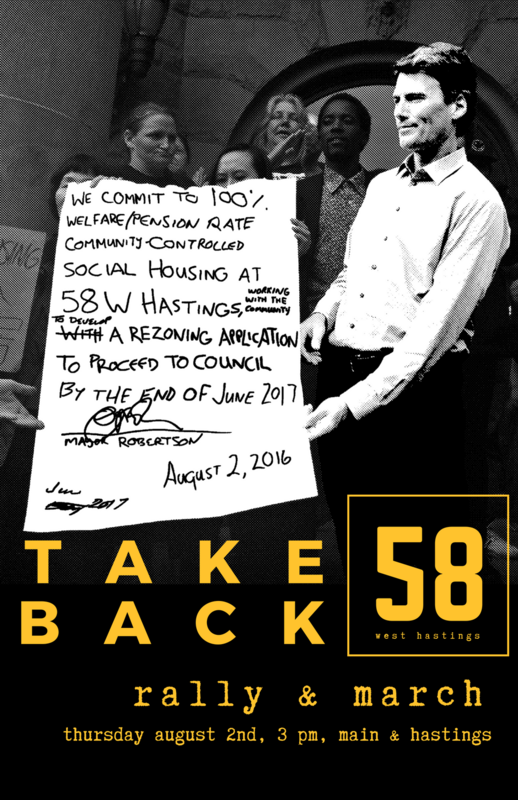 Beginning on August 23, the Coalition will wage a “58 day of rage” campaign leading up to the October 20 municipal election to demand Vancouver City Council keeps its promise to deliver 100% welfare- and pension-rate housing at 58 West Hastings. We invite all those in solidarity with the poor and working people of the Downtown Eastside and Chinatown to join us in our fight. Each day homelessness and the (loss of affordable housing due to gentrification) evictions crisis continue to worsen in our communities, now is the time to stand up and say enough! The OHCW coalition recognizes that this event takes place on the stolen territories of the Musqueam, Squamish, and Tsleil-Waututh First Nations.